Daisy is celebrating ten years in the best way possible - with sparkles! Daisy Anniversary Edition - 50ml EDT - $96, 100ml EDT - $118 - refashioned in translucent frosted glass, it features a gold cap with precious stones set in the heart of the daisy petals. The 50ml size can be found at Sephora and Shoppers Drug Mart stores across Canada while the 100ml size is exclusive to Hudson's Bay. 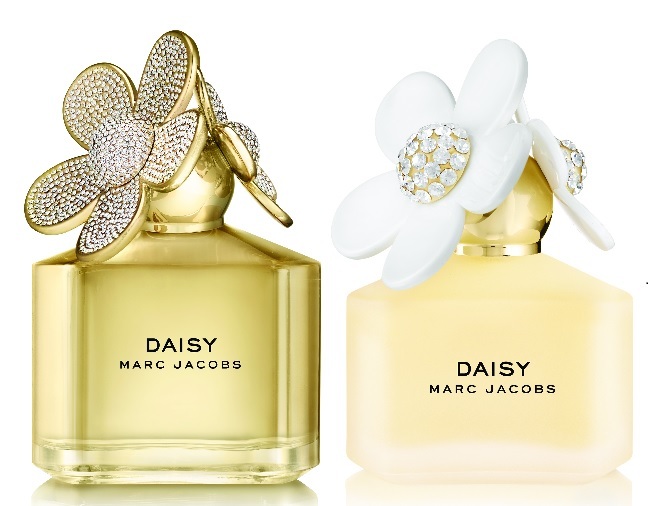 Daisy Deluxe Anniversary Edition - 100ml EDT - $450 - refashioned in metallic gold, the daisy petal cap has been hand-paved with more then a thousand shimmering crystal stones while the weighted glass flacon is wrapped in a slightly mirrored gold tint for an opulent touch. Available exclusively at Hudson's Bay stores across Canada. The fragrance itself is the same one we have known and loved all along with top notes of wild berries and white violet; a jasmine infusion heart; and a base of sandalwood. Available now, get them while they last!